Well, you got that hitch installed into the bed of your Toyota Tundra. The new camper has been purchased. Now it is time to go pick it up, but you don't want to look as if you don't know what your doing when you go to hitch it up. Well we are here to help. This article will direct you on how to hitch that fifth wheel. So you have been pulling trailers for a long time with your trusty Tundra, but you have always used a ball hitch to pull your camper. Now that the family has gotten bigger, you want to upgrade to a fifth wheel camper. Your old ball hitch is not going to do the job any more. 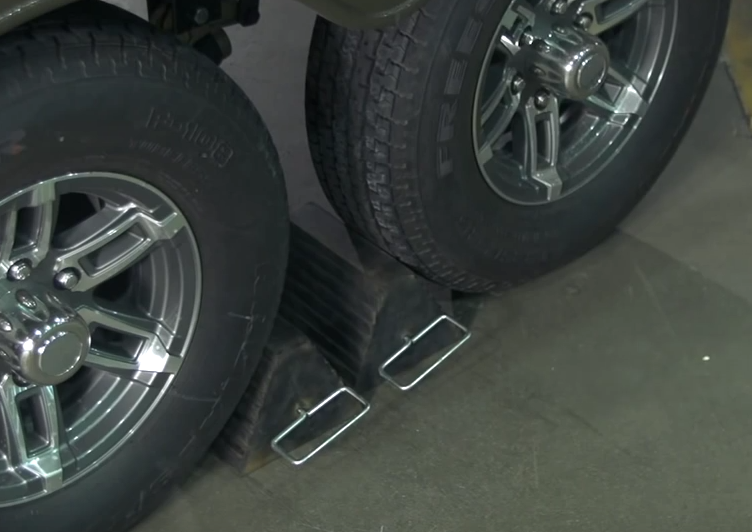 Time to upgrade to that big hitch thing you see in the back of the other guys' trucks. Figure 1. 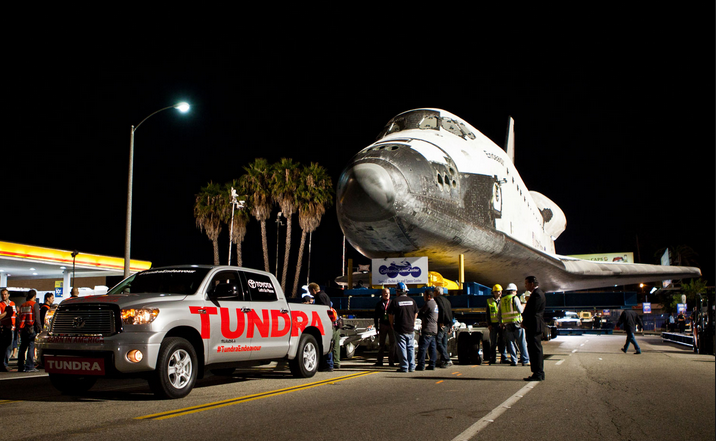 Tundra pulling the Space Shuttle. First I would like to talk about safety. The Tundra is a heavy duty truck and can pull a Space Shuttle, but it will not pull a battleship. Please make sure all of your loads do not exceed the manufacture's ratings. These are available in your owner's manual and on the driver's side door panel. Keep in mind that there are two specific weights: weight at the hitch and towing weight. Don't forget to include the weight of hitch, as it sits over the rear axle, and the weight of the camper, as it will become very heavy when loaded with all of your gear, water, propane etc. Hitching the fifth wheel trailer can be done by one person, but it sure is a lot easier with the help of a friend or family member. This will increase safety and make connections uncomplicated. First off, drop the tailgate and make sure any cargo hatches on the front of the camper are closed. The wheels of the trailer should be chocked to keep it from moving. Figure 2. Chock full of safety. Now line up the truck and back it up close enough to the trailer to get a good look at leveling the kingpin with the hitch. Do not back the truck up too far, as some trailers are shorter in the front than others and you could hit it. So, close that tailgate. Next, alter the height of the trailer so that the bottom plate of the pin box is slightly lower than the skid plate on the hitch; about 1/2-inch to 1-inch. Make sure that the handle on the receiver is in the open position. Now ease the hitch back into the kingpin. Some resistance is normal as the kingpin engages the hitch. Figure 3. Lining up the pin box. With the kingpin fully engaged by the hitches locking mechanism, close the safety handle and pin it to the hitch. Then attach the pull out brake away cable to the hitch, as well. Raise the tailgate and plug in your 7-way power connection to the truck. To insure that you have a solid connection, conduct a hitch pull test. Leave the chocks in, activate the trailer brakes and lightly press the accelerator. The trailer should hold the truck in place. If the trailer comes away, stop immediately and re-secure the trailer properly. Now, remove the chocks, raise the landing gear and go camping. Figure 4. Hitch pull test.